Asasm Director General of Police (DGP) Kuladhar Saikia on Sunday said that photograph speaks more than words. Meanwhile, senior photojournalist Tapan Das recalled the old days of photography and the dark rooms. “Dark room for a photographer was the most important part of photography during the era of analogue cameras. We had to capture a scene and go to the dark room for the output. The photographers had no option to preview a photograph on the spot and retake it which was a challenge for the photographers,” Das said. Photographs of photojournalists Biju Boro and Rebo Bora were showcased on the occasion. Photojournalist Tapan Das, APA president Chinmoy Roy, APA general secretary Rebo Bora, Guwahati Press Club general secretary Naba Thakuria, senior journalist Munin Bayan and editor of Niyomiya Barta Naresh Kalita were also present on the occasion. 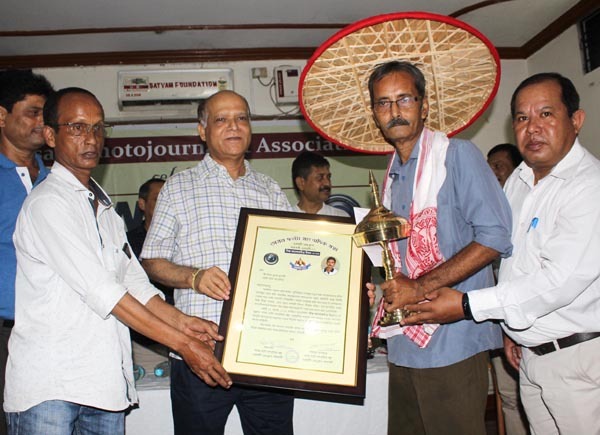 Senior photojournalist Kiran Mukherjee was felicitated with japi, gamosa, xorai and a citation on the occasion.